It’s incredibly hot during the day right now, but I always find myself a bit cold when I’m at work under the extreme air conditioning, or when I’m at the movies or in restaurants. And though it’s not nearly time for sweaters yet, I have been longing for a lightweight layer that I can wear over slip dresses with ease, or tuck into jeans. 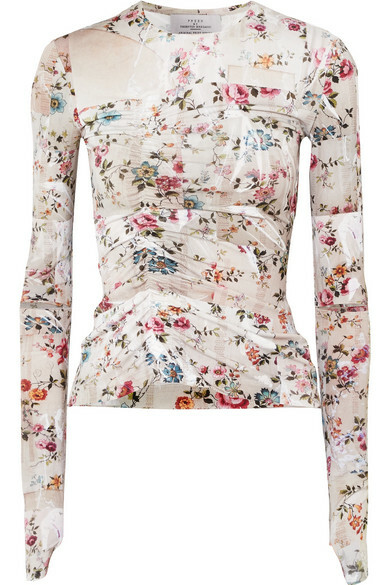 This Preen by Thornton Bregazzi stretch crepe top is the perfect solution. It’s lightweight, so you can layer or wear it by itself, and the floral print is modern enough to wear now and even in the winter. Designers Justin Thornton and Thea Bregazzi count Beyonce and Rihanna as die-hard fans, but the pieces are always approachable and have become staples in my closet. At $430, it’s a layer you’ll wear in so many ways the price is worth it.